Take the guesswork out of job estimating and put bigger profits on your bottom line. Mold shops have specific needs, especially when it comes to estimating. Anyone who knows mold shops knows that estimating a mold accurately comes from years of experience. Estimating a mold/die is not an exact science, so your estimator must have access to past quotes and job histories. The E2 Shop System manufacturing software makes this critical step in your molding business easier and more precise than ever. E2 manufacturing software can give your estimator critical job history information so that your quotes are accurate and ensure profitability. You also need the system to estimate the price of running some parts off the mold/die. Mold shops also have unique needs when it comes to scheduling. The E2 manufacturing scheduling software can work on hours instead of pieces so your scheduling is accurate and up to the minute. 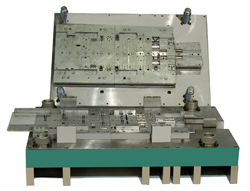 And just because you have worked 100 hours on the 200-hour mold/die, doesn’t mean you are 50% complete. E2 has custom reports for mold/die builders that track percent complete to show exactly how much work remains to be done. The E2 purchasing is also tightly integrated for mold shops. You see a complete material list for everything that is needed for all the jobs on the floor. Purchasing can be done directly for the job.